The lyre (λύρα) is a string instrument known for its use in Greek classical antiquity and later. The recitations of the Ancient Greeks were accompanied by lyre playing. The lyre of classical antiquity was ordinarily played by being strummed with a plectrum. A classical lyre has a hollow body or sound-chest (also known as soundbox or resonator), which, in ancient Greek tradition, was made out of turtle shell. Extending from this sound-chest are two raised arms, which are sometimes hollow, and are curved both outward and forward. They are connected near the top by a crossbar or yoke. An additional crossbar, fixed to the sound-chest, makes the bridge which transmits the vibrations of the strings. According to ancient Greek mythology, the young god Hermes stole a herd of sacred cows from Apollo. In order not to be followed, he made shoes for the cows which forced them to walk backwards. Apollo, following the trails, could not follow where the cows were going. Along the way, Hermes slaughtered one of the cows and offered all but the entrails to the gods. From the entrails he created the Lyre. Apollo, figuring out it was Hermes who had his cows, confronted the young god. Apollo was furious, but after hearing the sound of the lyre, his anger faded. Apollo offered to trade the herd of cattle for the lyre. Hence, the creation of the lyre is attributed to Hermes. Congratulations!! That´s a very good job. I like very much your great task and i think you' ve made a great effort. Greetings from A Estrada. I liked very much your job, i really think it's a great task, you' ve made a great effort. It's amazing!! Greetings from A Estrada. 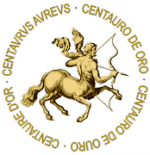 Me complace comunicaros que vuestro proyecto eTwinning “Homer in focus” ha sido galardonado con el Centauro de Oro que anualment otorga Chiron. Podréis ver la noticia publicada el próximo sábado 17 de mayo, día de Internet, en la portada de Chiron. ¡Nuestra enhorabuena! Y deseamos que continuéis con el mismo afán en difundir todo lo referente al mundo clásico. Lluís Inclan, Secretari de l’Associació Chiron.